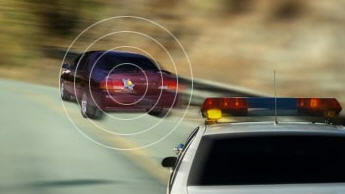 StarChase real-time tagging and tracking pursuit management system lets today's police solve a dangerous problem - how to catch criminals who lead them on a high-speed chase. To accomplish this goal, they have created a technology until now seen only in Star Wars [and elsewhere earlier - see reader comments]; namely, the throwable, sticky homing beacon tracking device. The StarChase system consists of a tracking projectile with a miniaturized GPS receiver, radio transmitter, power supply and a compressed-air launcher which can be hand-held or mounted on a police car. The golf ball-sized tracking device is coated with a highly efficient gluey compound. Once a fleeing suspect's car has been tagged using the air launcher, its position can be determined via GPS, which is transmitted wirelessly from the StarChase tracking device. The police dispatch center can view the location of the suspect vehicle in real-time, coordinating resources for a safe, efficient apprehension. The company's website states that there are 100,000 car chases per year in the United States; most of them expose officers and innocent civilians to danger. The system is being tested first in Los Angeles, which sees more than 6,000 car chases each year, many of them also shown on cable TV. A similar idea has been used in the Star Wars movies. In Episode II: Attack of the Clones, Obiwan Kenobi fights with bounty hunter Jango Fett on the cloner planet Kamino. When Fett takes off in his ship Slave I, Obiwan takes careful aim, and zings a homing beacon that attaches itself to Fett's ship. A somewhat more advanced model than the StarChase device, the Jedi homing beacon tracking device allows Obiwan to follow Fett through both hyperspace and heavy asteroid fields. Read a bit more on the StarChaser website and here; found this one on /..